In the early 1970s, a couple of hundred wild rats near the Siberian city of Novosibirsk were rounded up by scientists for an ambitious experiment to understand how animals evolve during domestication. Dimitry Belyaev and his colleagues—known for their related project on domesticating foxes—split the rats into two groups. With one group, the researchers tried to replicate the way human ancestors had tamed wild animals over generations. At each generation, only the tamest of the rats were selected for breeding. With the other group, they did the opposite, breeding only the rats that were most wary of and aggressive towards humans. After more than sixty generations of selection, the immediate response of rats from the “aggressive” line is to escape or attack. 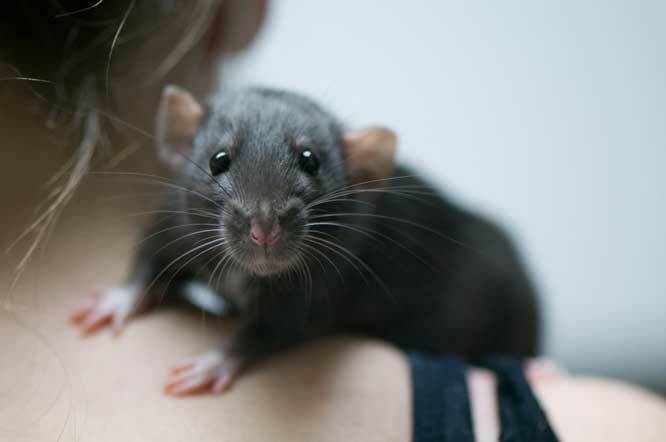 In contrast, the rats from the “tame” line can be handled and even petted. In this month’s issue of GENETICS, Heyne et al. report quantitative trait loci (QTLs) contributing to this rapidly-evolved behavior difference, including genetic influences on gene expression in the brain. Their results show that the genetic architecture of tameness in these rats is more complex than once thought. Albert et al. had previously mapped QTLs contributing to the difference in tameness by crossing the two rat lines (using an F2 intercross design). But the analysis method they used assumed the causative alleles were fixed in each population — that is, in the tame population, all rats were homozygous for the “tameness” alleles and in the aggressive population, all rats were homozygous for the corresponding “aggression” alleles. In the new study, the authors reasoned that both rat lines were genetically diverse enough to violate this assumption. Because the founders came from a wild population, and matings between close relatives were avoided over the generations of selection, multiple alleles at the causative loci may still be present within each line. Heyne et al. revisited the mapping data using an analysis method (FIA) that can account for such segregating—as opposed to fixed—variation, and found eight QTLs, including the two discovered previously. Given that effects on behavior are likely to involve the brain, the authors also applied the FIA method to identify hundreds of QTLs affecting differences in brain gene expression between the lines (a.k.a. eQTLs). They used this information to select good candidates for causative genes within the “tameness” QTL regions. First, they looked for genes in the behavior QTLs that overlapped one of the gene expression QTLs, then narrowed down the list to those genes that were expressed at different levels in the brains of tame vs. aggressive rats. The most plausible candidate genes would not only have overlapping behavior and expression QTLs, but both QTLs would be caused by the same underlying variants. The authors looked for evidence for shared underlying variants using the ability of the FIA method to estimate the effects for multiple alleles per QTL. In those cases where multiple alleles are involved, the relative effect of each of the different alleles should be correlated across the two traits being measured, i.e. behavior and gene expression. Five of the candidate genes showed significant correlations and the authors consider these genes the most likely to play key roles in shaping behavior differences between the two populations. These candidates look promising so far. Three of the genes are involved in nervous system development and one, Slc17a7, has previously been implicated in fear and stress behavior in mice. Further work is needed to test which genes contribute significantly to the remarkable behavior differences between the two types of rat. Read the press release: Genes contribute to behavior differences between fierce and friendly rats. Listen to co-author Alex Cagan talk about this work in an interview with NPR’s Science Friday. Read about why domesticated mammals may share so many traits in Does neural crest development drive domestication syndrome? Read about how an endogenous retrovirus gave many domestic cats their distinctive coat patterns How the cat got its spots (and hearing problems).